No one gets a dog thinking of the day that they might have to give it up. But, as my dear father used to say, "life happens, things change", and there sometimes comes the point at which we have to make the difficult decision to surrender our dog. It is a tough decision, made harder when we don't know what kind of a life we are surrendering our dog to. Allow me to help. I work with many surrendered dogs, and they, like their owners, each have a unique story. My goal is simple: I want to make the transition as smooth and painless as possible, and always in the best interest of the dog. Dogs are taken in on a case-by-case basis, and all fostering arrangements require a full and detailed meeting about the dog's history and behaviours. I personally re-train surrendered dogs with behavioural issues, and I carefully screen every potential adopter. So if you find yourself in the difficult position of considering surrendering your dog, please make Deena Speaks Dog your first call. 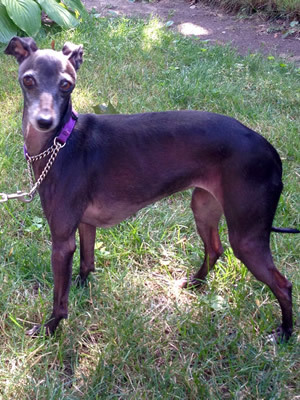 Hi Deena, just thought we would write you on the progress of Chloe, the rescue Italian Greyhound. She is a "fixed" little lady of some 14 pounds who has fit in very nicely to our home. My husband and I are dog people but had been without an animal for several years. To add to our rather boring home, we decided it was time for another companion. And along came Chloe from Deena to fill that gap. She is a great little dog, well trained, polite and full of love. We thank you Deena for adding Chloe to our life. 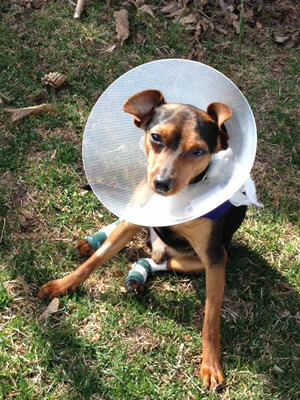 I am writing you Deena to thank you for introducing my wife and I to Tye, a rescue Miniature Pincher dog. Tye has been with us just over a year now and has not yet had his second birthday. We have had him just one year. He is a healthy spirited little guy who brings a lot of fun and love to an old retired couple. I find him very well trained for a pup, true to his described personality, and has fit into our family with great joy and loving. He is a character, a little headstrong, has made a real effort to take over the household, is great company for our 6 year old Bichon Frise (although the long established female finds him a pain) but who has turned into a more active pet. With the addition of Tye to our home, many additional years of fun and companionship have been added to the family. We just love and enjoy him. We found ourselves facing a very difficult decision. 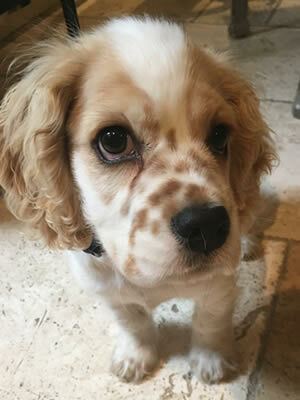 We knew we had to find another home for our little Henry the cocker spaniel and a friend recommended us to Deena. Deena was quick to respond and she was so kind and compassionate about the situation. I felt very confident about the process. Deena looked after Henry for a few weeks and then found him a permanent home through her extensive network. We were even able to visit him before he went off to his new family. If you ever find yourselves in a similar situation and struggling with what to do, I encourage you to call Deena. 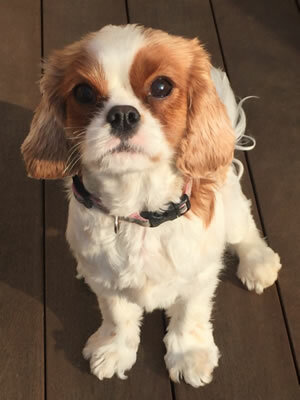 I want to thank you for bringing Ginger, the one year old Cavalier King Charles Spaniel rescue into our lives. From the moment we me her, it was love at first site. Your kindness and compassion for dogs is evident as Ginger is most loving and gentle dog. You clearly want the best for all the dogs you help and take the time to find the best home for them suited to their personality. Thank you for making the adoption process so smooth and simple. Ginger has quickly become part of our family and a wonderful companion to our 13 year old Cavalier Spaniel. We could not be more grateful. We were looking for a dog to adopt and got Deena's email from Hold My Paws. 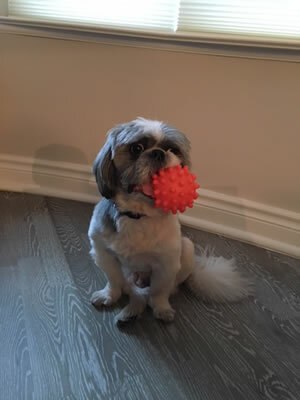 Deena introduced us to Sandy - a 7 years old Lhasa Apso, who was surrendered by his previous family. Deena took care of Sandy for a while before we came along, got him up to date on vaccinations, and had him groomed. Thank you, Deena, for bringing Sandy and us together!